WeetHet - Audio - How to creat my own WAV's? Copying songs from a music CD to your harddisk is usually done in WAV format. This way you can take songs from several CD's and make a compilation of your own favorite songs on a single CD. In this guide I use Nero by Ahead of which you can download (not crippled) trial version at their website. Copying songs to WAV is not very efficient on the space use on your harddrive, but the quality remains a 100% copy of the original soundtrack. On the page "How do I create my own music CD?" you will find more information on the use of WAV files. 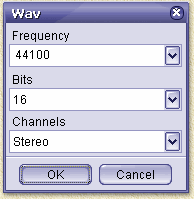 Settings of the WAV properties. Finding a place for your WAV's. 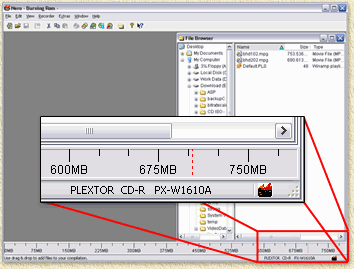 Pretty quick, Nero is finished analysing the CD and will show the CD-Database window. Here you can create a databse of your own CD collection, or get the CD author, titles etc. from the Internet. Information of this CD can be retrieved of a so called CDDB - a very large CD-content database. This can save you a lot of time, typing the titles of songs etc. This data - if available for the CD you have - is being used for generating filenames for your WAV's in the format "band - title.wav" instead of "Track01.wav". So suppose you have the CD of "Anne Clark" and the song you are about to copy is called "Shades", your WAV will be called "Anne Clark - Shades.wav". Which can save you a lot of time later on when looking for that particular song in your WAV collection. Now you can selecteer the songs you would like to convert to an WAV, using the left mouse button (or click the "Select All" button if you want them all). When selecting 2 or more songs, keep the CTRL toets pressed while selecting your songs. Windows explorer works in a similar fashion. At the field "Output file format:" you can set the desired output format. By default it is set to "PCM Wav file (*.WAV)". Now click the button "Settings..." for detailed settings - the default settings are not good enough for us. According to the CD format we are going to be using a 44.100 Hz samplerate. I just guess that you would like to have both channels in stereo. Step 7: Where to store your WAV's? Here you can define where to put the WAV's files. At the field "Path" you can enter the path where to store your WAV's by typing it. You can also (which is easier) click the "..." button and browse your PC for a location. Depending on the speed of your PC, the amount of memory and the speed of the CD-player,... it's different for each PC.